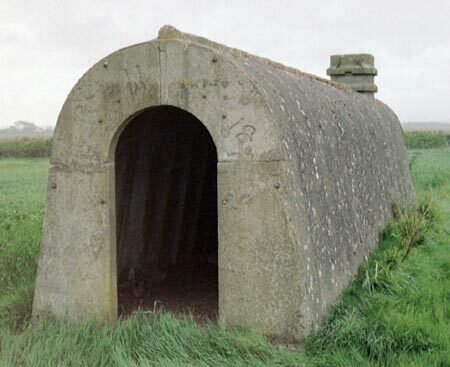 One of several prefabricated type air-raid shelters dotted about the aerodrome at Kirkbride. This particular example - a variant of the 'Stanton' type - sits incongruously amidst a barley-field, its protective earth covering long gone, all remnants of soil being whipped away by the prevailing wind, fresh off the nearby Solway Firth. If it ever had any protective earth, of course... Initially I wondered why this shelter stood where it does, just off the Abbeytown road opposite the runway entrance, some six-hundred yards from the Officers' Mess (now the 'White Heather' Country-Club and Hotel). It occurred to me that it might have been removed from elsewhere post-war, and reconstructed. The footings are in place, however, and a look at the 1:25,000 OS map reveals tracks in the vicinity, so perhaps it was in its original location. It might not even have been used as an air-raid shelter! Most of the other shelters at Kirkbride are still covered - or part-covered - by a thick layer of soil. The linkable images above illustrate further the versatility of this type of building, which - according to Austin J. Ruddy (author of the official handbook of the Pillbox Study Group) - was manufactured in sections by the Stanton Ironworks Company, Nottingham. Different lengths could therefore be constructed. An example of a shorter version can be seen in an adjacent field, and also at Rose Hill, Harrington, Cumbria. Air-raid shelters were not the only wartime buildings to be manufactured by these means. The pre-cast concrete sections were used for 'Q'-type decoy buildings to house the generators, examples of which can be found at Scaleby and Edderside. The other shelters at Kirkbride appear to be 'Stanton' shelters of a different variety. This 'Stanton' differs in profile from the other type, insofar as the profile - when looking at it end-on - is less of a 'vault' shape with no pointed top. Comparison can be made with the one on my Silloth page. Kirkbride aerodrome was planned as an Aircraft Storage Unit in 1938. In 1939, No:12 Maintenance Unit was formed, remaining active until closure of the aerodrome in 1960. There are some pill-boxes nearby, which also feature on my web-site.